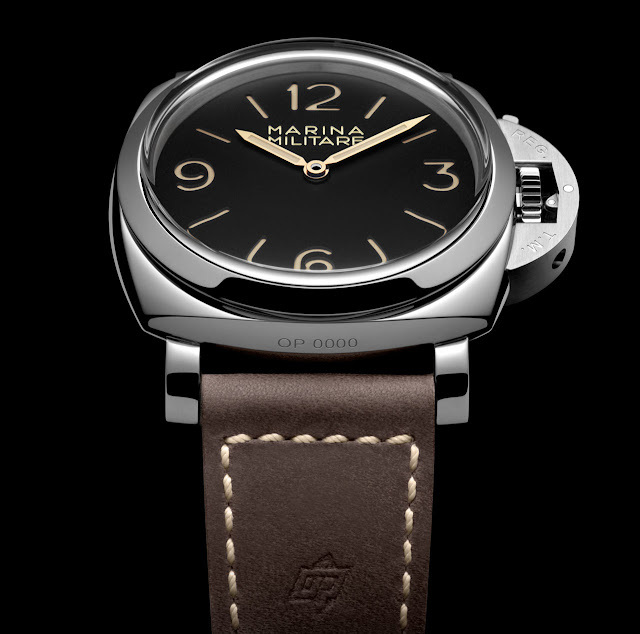 As precision instruments used for special missions and covered by military secrecy, some watches produced by Panerai in the 1940s had no indication on the dial apart from the hour markers. 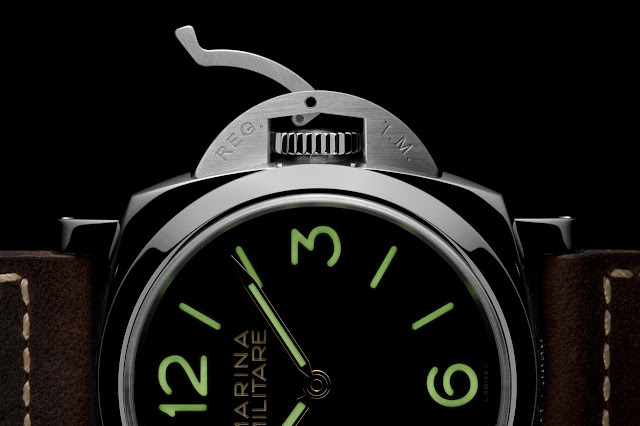 Nonetheless, most models carried names referring to the luminous substance used on the dial – Radiomir or Luminor – or to the institution which commissioned the watches, in particular the Italian Navy. Equipped with the same case of the regular production PAM372 model (one of the most appreciated models by Panerai enthusiasts), the new Luminor 1950 3 Days PAM673 is a special edition of 1,000 units faithfully reproducing the design of the historic models characterised by the inscription "MARINA MILITARE" on the dial. 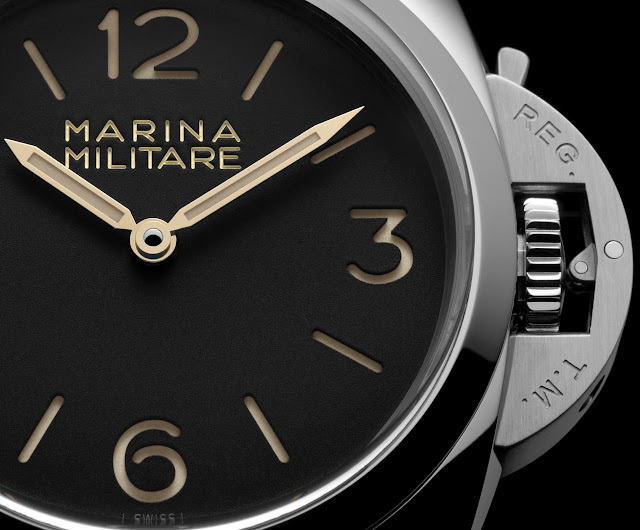 With its unique sandwich structure and its use of Grade A Super-LumiNova, the black dial is clean and perfectly readable. 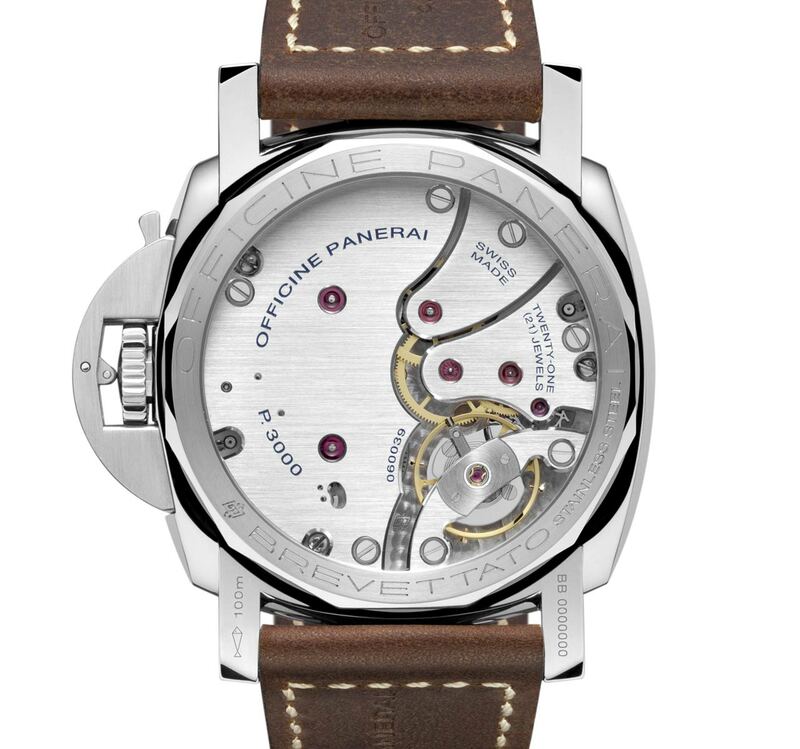 Water resistant to 100 metres / 330 feet, the 47 mm case is made of AISI 316L stainless steel with a polished finish and the unmistakable lever bridge device protecting the winding crown. To protect the dial, the crystal is made not of sapphire glass but of lightly domed Plexiglas, as in the vintage examples where the crystal was made of polymethylacrylate. The hand-wound P.3000 calibre, entirely made in the Panerai Manufacture in Neuchâtel, is visible through the sapphire porthole on the back of the new watches. 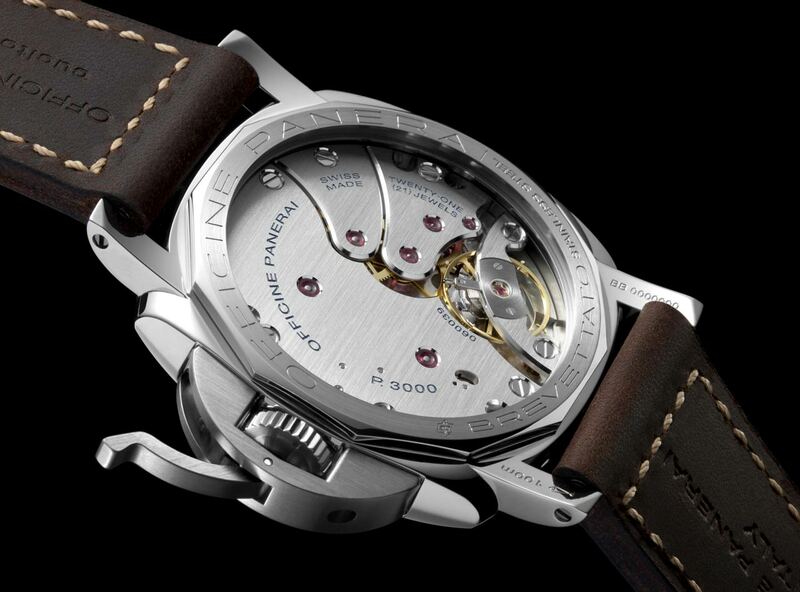 The movement has three satin finished bridges protecting the movement and a further bridge with twin supports for the balance wheel vibrating at a frequency of 3 Hz (21,600 vph) while two spring barrels deliver a power reserve of three days. 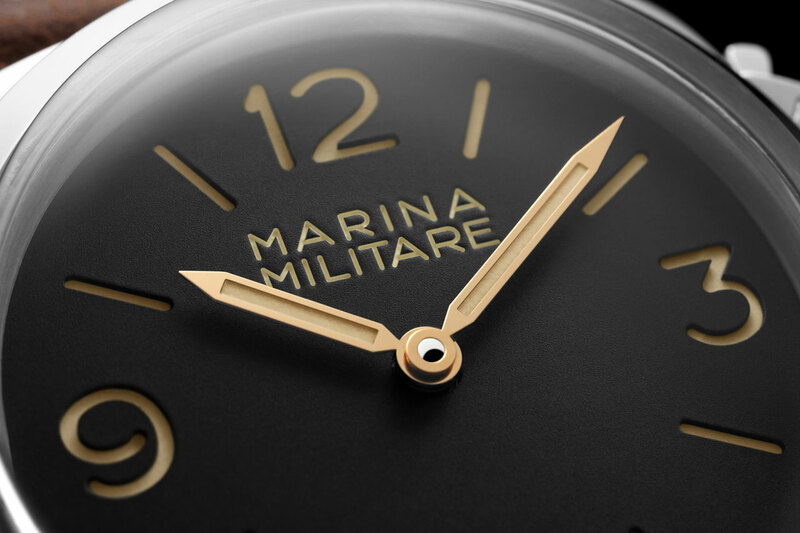 The watch is supplied with a Ponte Vecchio brown strap made and treated in traditional Tuscan leather workshops. The wood box contains a second rubber strap, a spare Plexiglas crystal, a steel screwdriver and a personalised certificate with the serial number of the Special Edition. 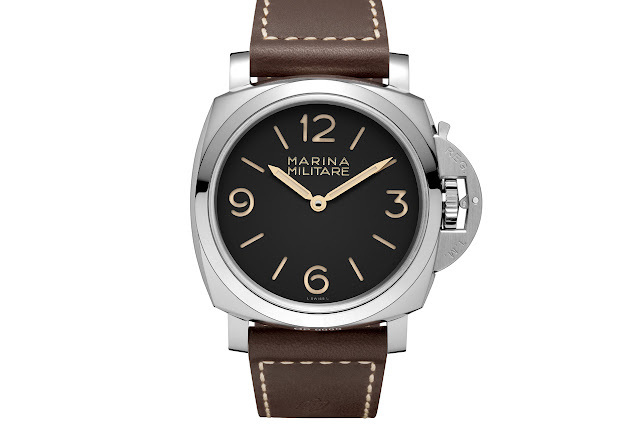 Officine Panerai Luminor 1950 3 Days 47mm Marina Militare PAM673. Equipped with the same case of the regular production PAM372 model, the new Luminor 1950 3 Days PAM00673 is a special edition of 1,000 units with the inscription "MARINA MILITARE" on the dial faithfully reproducing the design of the historic models. 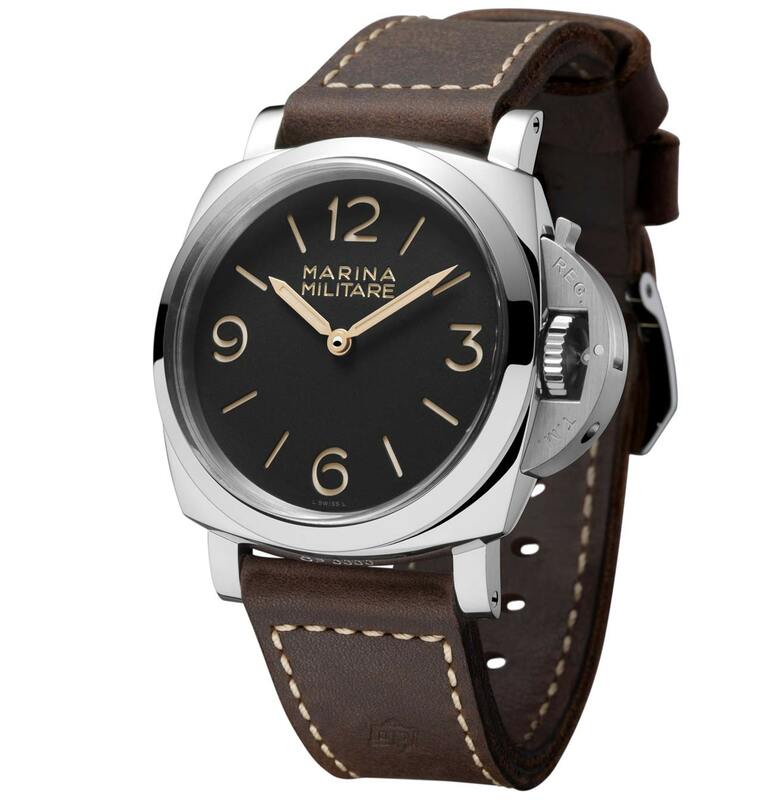 The Officine Panerai Luminor 1950 3 Days 47mm Marina Militare PAM673 has a price of Euro 9,900 / US$ 12,750.